Look at how stupid we look in these silly tees! Leaving New York without buying one of these t-shirts is a crime. This is the end of our NYC posts. Aww so sad! But excited for the next adventure! You don't look stupid at all, you look adorable! 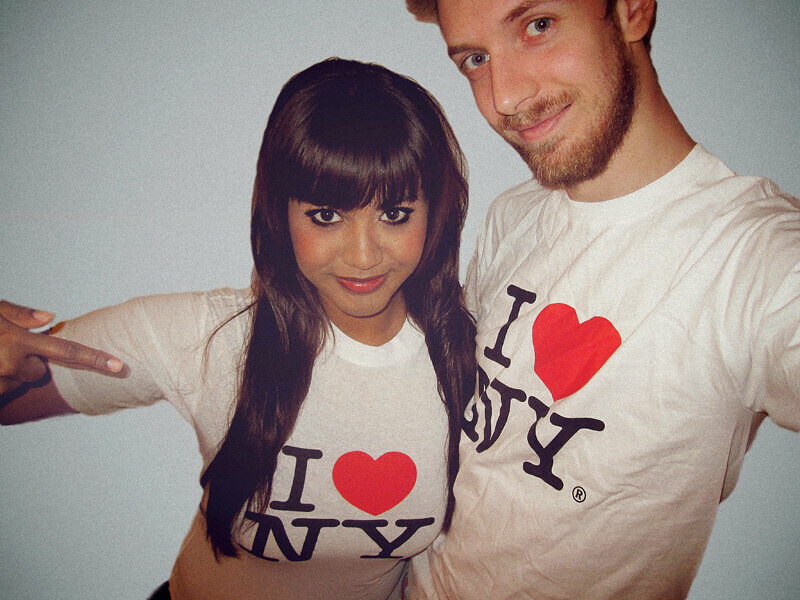 I <3 NYC too!!! When I was moving to Holland from New York, my friends looked for the same tee in Dutch...of course, that didn't exist, so they gave it to me in the closest language: German! Love those shirts, so perfect. So now adventures in Montreal?? It's a classic ! I live close to Nancy, France, and there is a tshirt that says, I love N Y ( with the letters ANC written really small between the N and the Y). Clever, right?? obviously can't leave there without one!! excited to see what you guys have been up to since then! 1. agree with Jenni Austria Germany - love your fringe! what part of spain? for how long?! Oh, but you have to get the cheesy t-shirts! They're so much fun. loved all of your new york posts, in fact- just love your travel blog overall. can't wait to see what's ahead..! Some how you guys don't make it look like tacky tourist wear! Gotta love NYC. What a city! I have only been to New York once, but I came home with one of those tshirts! Your photos of the city are gorgeous! Um how gorgeous are you Mina?! We are planning on Montreal in Spring!!! You gotta give us tips! ahahha YES! its a crime to not buy those tee!